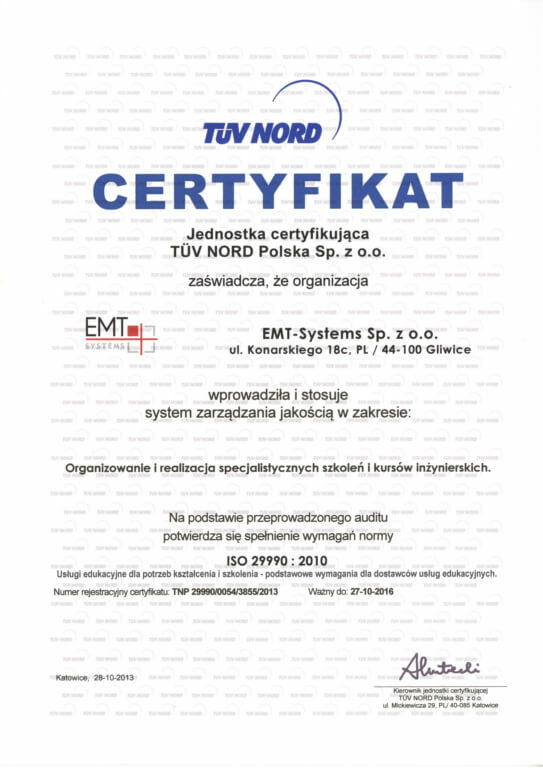 Certification audit was conducted on 9 October 2013 by auditors from TÜV Nord. 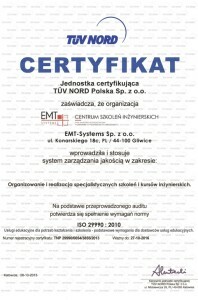 Due to the positive result of the audit an application has been filed to award a certificate confirming that EMT-Systems Sp. z o.o. [Ltd.] is capable of satisfying the requirements set by those norms. Awarded certificates encourage us to constantly improve and update our services. EMT-Systems has decided to implement the integrated quality management system being a guarantee of high quality of services and client’s satisfaction. This documented and coherent system enables efficient and simultaneous management of many areas of activity in EMT-Systems Sp. z o.o. [Ltd.] due to establishing and following the uniform QUALITY POLICY. The international standard ISO 29990 for non-formal education and training was created for that particular business sector. The standard puts gaining and extending knowledge in the center of attention. It is mainly intended for satisfying the needs of every form of education and vocational training, it can be however also applied in schools, vocational training centers and higher education units. Standard ISO 9001 is successfully applied in industry; it does not, however, include many of the requirements for education. Compared with Standard 9001, Standard ISO 29990 relates to the specific knowledge gaining situations much more clearly. 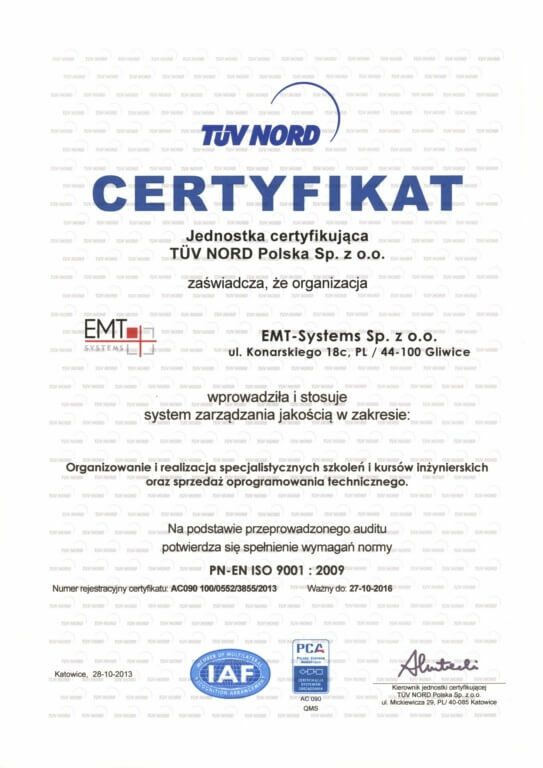 Standard ISO 29990 exceeds the requirements of other „classic” product certification systems in terms of organization, management, staff, processes, control and evaluation in a way that makes ISO 29990 much better adjusted to the specific requirements for education and trainings when compared with other systems. awarded with certification according to ISO 29990:2010. 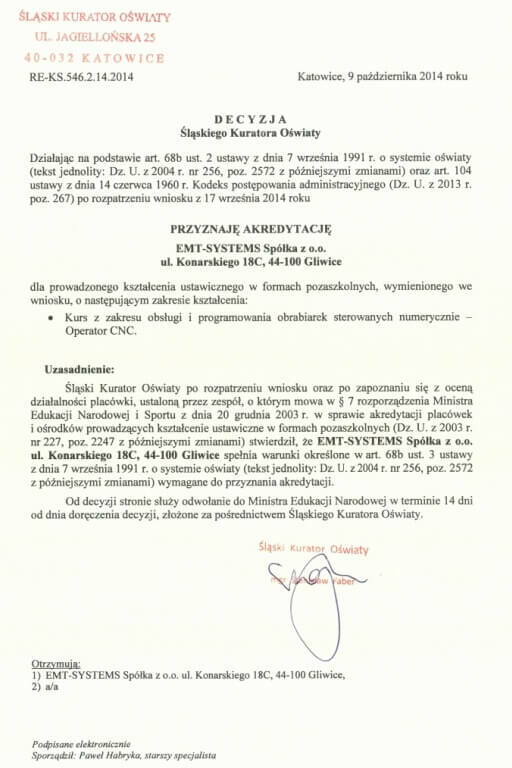 In October 2014 EMT-Systems, after verification performed by the committee appointed by the Education Office, was granted accreditation from the Education Office for providing continuing education in non-school educational institutions: “The course of operating and programming numerically controlled machine tools – CNC Operator”. The accreditation may be applied for by establishments and centers for continuing education in non-school educational institutions on the terms specified in the Ordinance of the Minister of National Education and Sport of 20th December 2003 on accreditation of establishments and centers providing continuing education in non-school institutions (Journal of Laws 2003 No. 227, item. 2247, as amended). What significance does accreditation have? For EMT-Systems, the acquired accreditation is the culmination of many years of work and an incentive for further action. We hope that the accreditation will contribute to building and strengthening trust of current and future customers to our company. The Engineering Training Center EMT Systems Sp. z o.o. has been awarded a grand prize in the prestigious competition for training companies 2014 Training Company of the Year and 2014 Training Program of the Year! 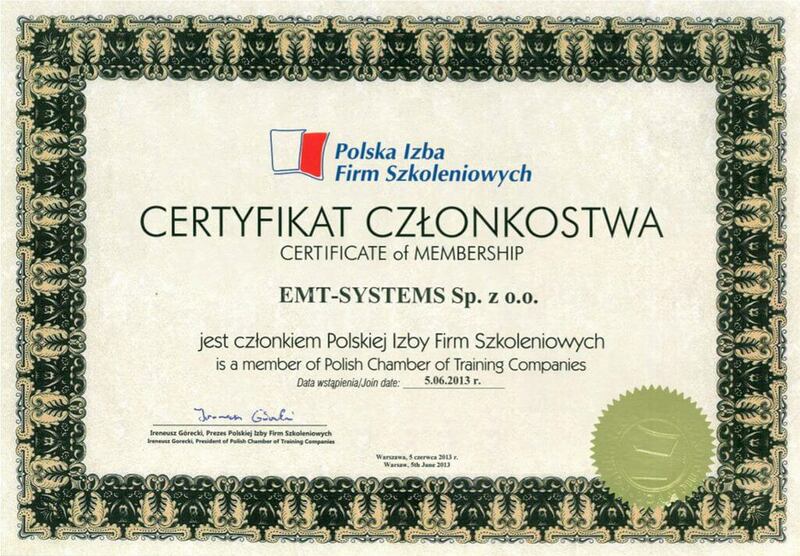 We have been a member of the Polish Chamber of Training Companies since June 2013. As a member of this organization we are obliged to obey the regulations of the Code of Good Practice and use them in our everyday work. We have also signed the Training Service Standard document and committed ourselves to complying with the provisions contained therein. We are driven by the rules of professional ethics and business integrity. Code of Good Practice is a trainer’s desideratum describing good practices and actions permissible from the point of view of large representation of training companies as well as applicable laws. Thereby, Polish Chamber of Training Companies have given the market a tool allowing the parties of training agreement to control the process in order to make it an effective investment. 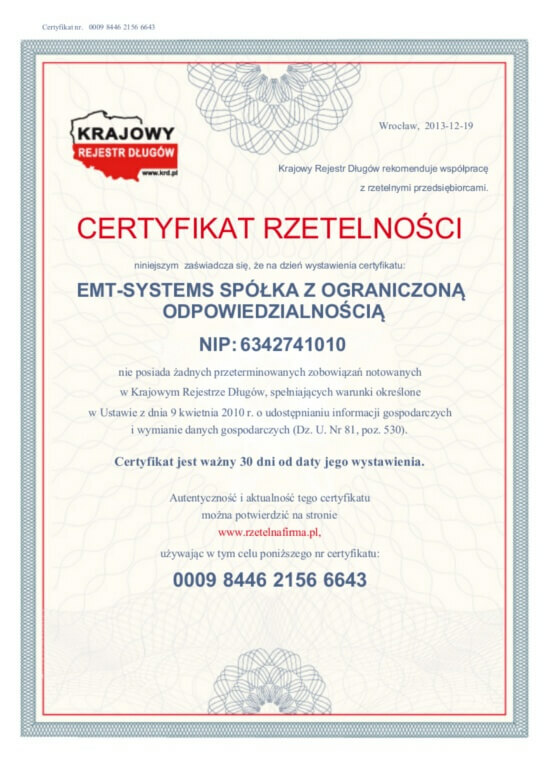 EMT-Systems has been awarded with the Certificate “Rzetelna Firma” („Reliable Company”). This Certificate, awarded by the National Debt Register, promotes reliable entrepreneurs conscientiously and timely settling their liabilities. Settlement of liabilities by the business entities is a basis and guarantee of successful cooperation. Due to this fact we settle our liabilities in a timely manner and we expect the same from our business partners. 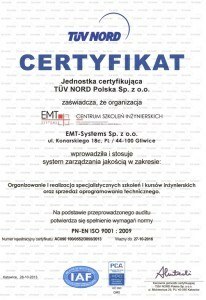 Certificate „Rzetelna Firma” („Reliable Company) is a perfect recommendation for our honesty.